Human beings are clearly obsessed with time. One evidence is our creation of a means of calculating time (i.e. clocks, my friends). We’ve been trying our best to win a race with time (we even tried creating time machines), but we fail every time we try to. This is probably why humans devised schedule example: in order to, at least, be able to manage time while living their fleeting days. Continue reading to learn more about sample schedules, appointment schedules, in particular, and learn a few basic tips in writing schedules. 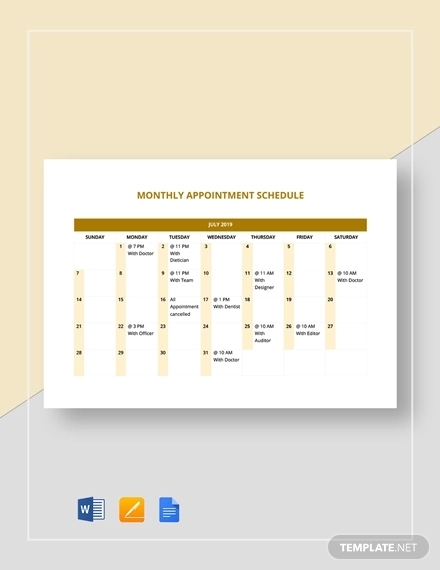 What Is an Appointment Schedule? 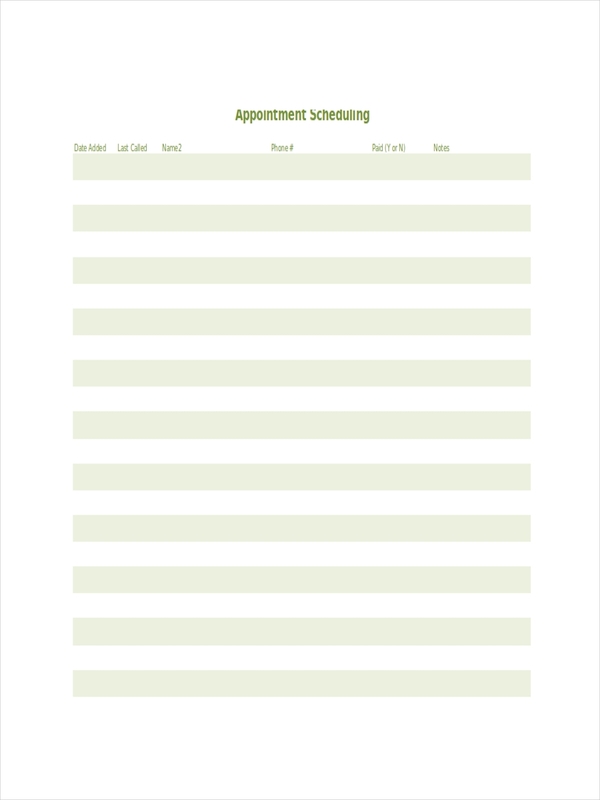 An appointment schedule is a blank schedule or calendar indicating an individuals appointments including the date and time of such appointments. It may also contain details about the appointment, as well as the persons involved in the appointment. At times, an appointment schedule may include a few reminders that the user usually writes to remind him about certain things. 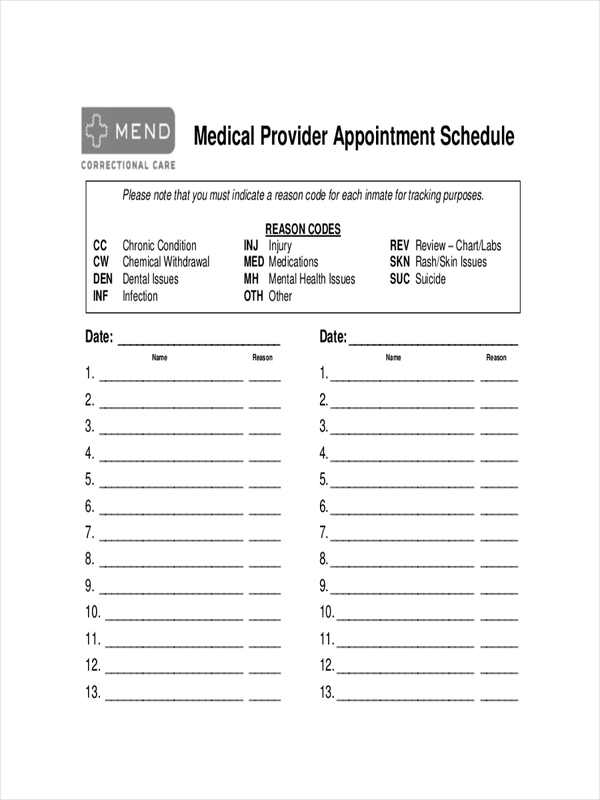 An appointment schedule basically allows an individual to manage his/her appointments. 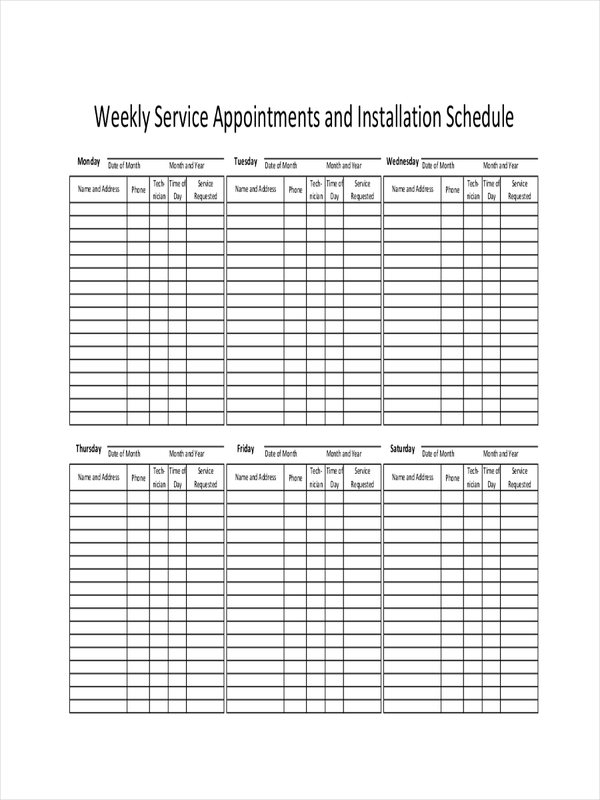 An appointment schedule typically helps a person monitor his/her availability on certain dates in his/her calendar. This will help one make the necessary preparations, cancellations, or rescheduling in case there happens to be a conflict in schedule. Busy people find appointment schedules really convenient since they are able to proceed with their daily activities schedule without worrying of missing a few important appointments. This will enable them to effectively manage and allocate their time, and focus more on the most pressing matters, or most important appointments to attend to. 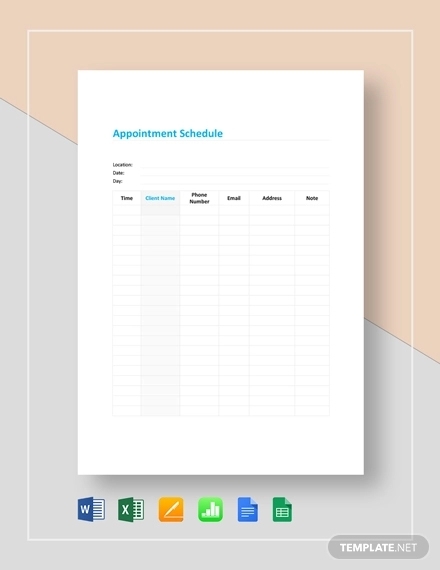 Simply put, an appointment schedule reminder serves as a reminder to its user. An appointment schedule can really help its user big time. Following one can really make a big difference to an individual’s daily schedule, and of course, his/her schedule of appointments. So how do you make one? 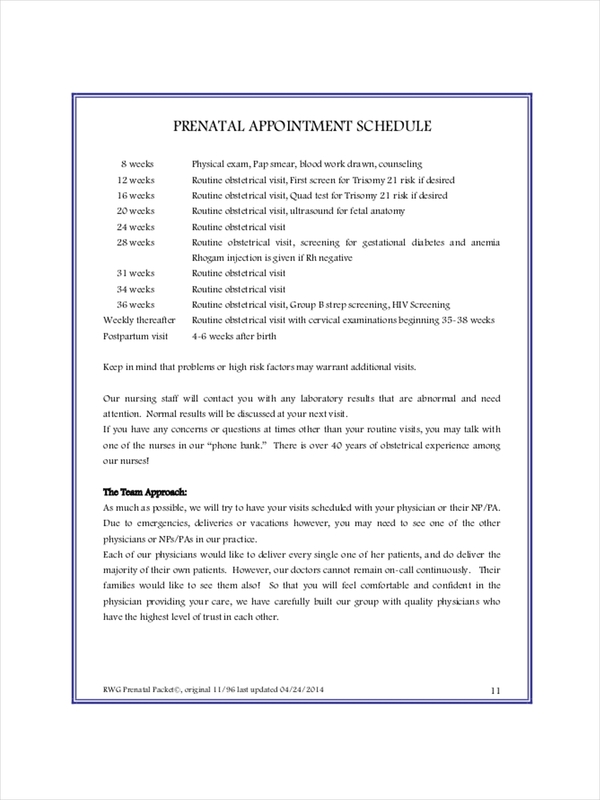 Here are a few guidelines in making an appointment schedule, which I hope would be helpful. 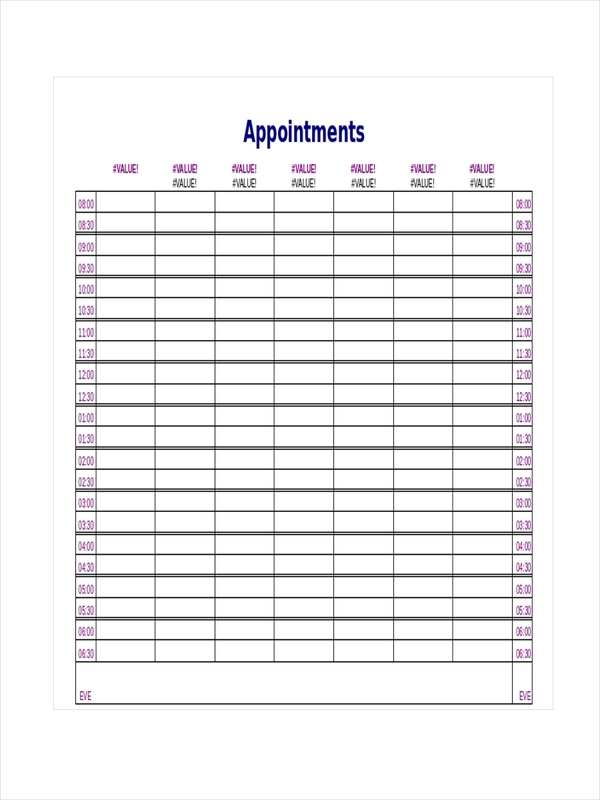 Make a list of appointments, including the date and place of the said appointment. Include the persons involved in a specific appointment. Provide details of the appointments. You can also include a few reminders (if any). This will also help you identify the level of importance an appointment has. Arrange your schedule. 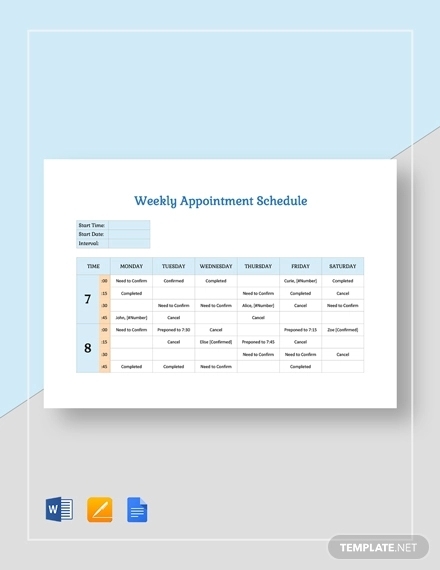 Create a time table, or a timeline where you can write your appointments and arrange them according to the closest appointment date to the farthest one. 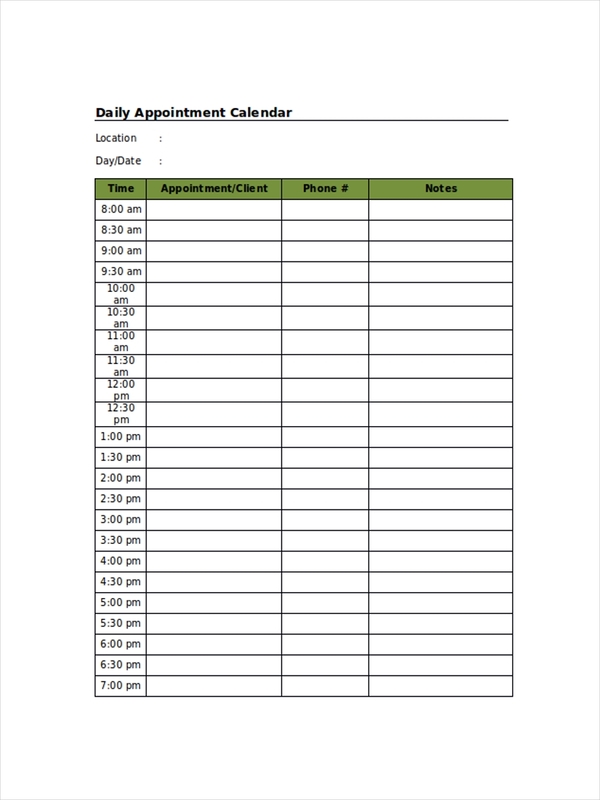 If you don’t have any appointments yet, create a blank appointment schedule where you can easily input your appointments in case you schedule one. Make sure your appointment schedule is clear and understandable to avoid confusion. The key is to keep it simple, instead of putting unnecessary stuff. Review and improve your appointment schedule as needed. As you learn how to navigate through your schedule, you’ll find a few things to improve, and of course, you’ll be great in scheduling your own appointments in no time.